While most of us purchase shoes depending on our style preferences and budget, we rarely think about whether they are the most flattering for our legs and feet—just that they’re just super-cute and on-trend. But for girls with muscular legs, the struggle is real. Will they pinch my calves? Draw attention to my ankles? These questions are especially present in light of a major new trend: lace-up flats. Over the past year, every notable blogger from Julie Sariña of Sincerely Jules to Chiara Ferragni of The Blonde Salad has been seen wearing some variation of the silhouette. Not your typical ballet flats, lace-ups tie around the ankle, adding a little pizzazz to any outfit but also a conundrum for the more muscled among us: Anything that ties around your calves is bound to draw attention to them, especially so with flats, which already tend to emphasize your legs. Fortunately, there are a few ways to wear the fashion favorite without drawing unwanted attention. 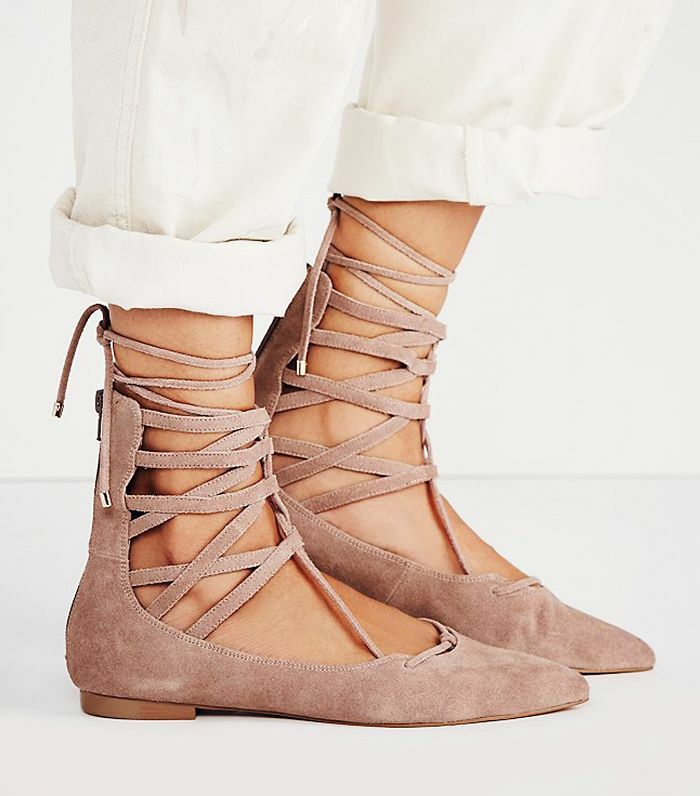 So if you’re one of those girls with muscular legs who’s struggling to find a flattering lace-up flat, keep scrolling for our selections, and make sure to follow these guidelines to make your legs look leaner and longer. Skin-tone flats blend in with and therefore act as an extension of the legs, making muscular ones look longer. Rounded toes add weight to your legs and make them look heavier. Pointed toes lessen this effect. For muscular legs, it’s important to show a little more skin, because it’s going to make legs appear leaner and even longer. Too much coverage on the foot is going to make the foot look heavier and larger. A cutaway design, cutouts, or strappy styles are going to look a little bit better. Exposing more skin avoids drawing too much attention to one specific area of the leg. Are you one of those girls with muscular legs? Tell us how you flatter them!